Much has already been written on warfare in ancient Greece, yet there are a number of factors that nevertheless warrant the publication of another book on this topic. Firstly, this book provides a detailed, diachronic treatment of a dynamic and formative period of Greek history: from the Mycenaean Bronze Age down to the Persian Wars. Secondly, it offers an up-to-date and detailed treatment of the archaeological evidence in addition to the ancient texts. Thirdly, it places the military developments into their proper cultural and historical contexts: warfare was not merely an activity that ancient peoples frequently engaged in, but served a much broader function as a constituent element of their cultural identities. Using the Homeric epics as a guide, the reader is presented with a cultural history of warriors and warfare in early Greece: from the chariot-borne soldiers of the Mycenaean palaces to the seaborne raiders of women and cattle of the Dark Age; from the men of bronze who helped liberate Egypt from the Assyrian yoke down to the Battles of Thermopylae and Salamis. Along the way, a number of detailed issues are considered, including the proper place of the Greek hoplite in the history of the Eastern Mediterranean, the possible origins of the Argive shield, developments in naval warfare, and the activities of Greek mercenaries. 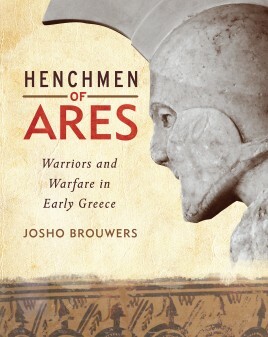 Henchmen of Ares is an expanded and revised version of the doctoral dissertation on Early Greek warfare by Mediterranean archaeologist Josho Brouwers, editor of Ancient Warfare magazine. It has been completely restructured and reworked to make the text accessible to a general audience, while also offering a detailed treatment of the relevant sources and a further reading section for more serious students and specialists alike. Josho Brouwers studied Mediterranean Archaeology at the VU University in Amsterdam, where he received both his Master’s degree and his PhD. After publishing Henchmen of Ares, he worked for Karwansaray Publishers from 2012 to 2017 as the editor of Ancient Warfare and later Ancient History Magazine.